The Annual Seminar of the Limassol Branch was on Modern Seamanship. 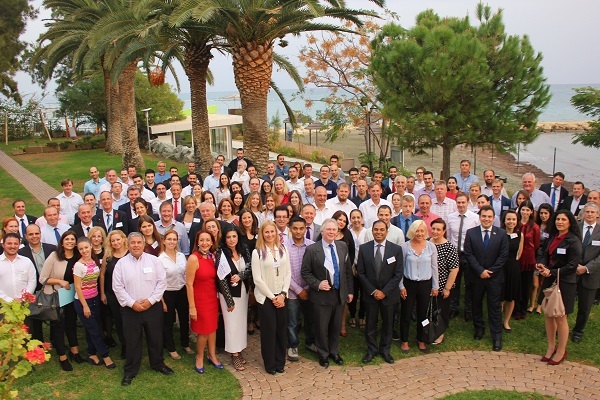 This half-day event was held at the Crowne Plaza Hotel, Limassol and was supported by over 120 delegates. Iain started by commenting that the updating the seamanship skills was very much on their mind when his group recently published the book- ‘21st Century Seamanship’. He explored some definitions of seamanship, notably that, it was ‘a state of mind’, and included ‘skill in and knowledge of the work of navigating, maintaining and operating a vessel’. He pointed out that Seamanship as a skill is rapidly changing and developing. He mentioned how traditional skills such as using a jury rudder are unlikely to be used, as well as topics about handling union purchases and preventer wires. Today’s need for seamanship is as diverse as the types of ship around. Iain illustrated examples of poor seamanship from recent case study of the ‘ID Integrity’ and the ‘Searose G’. On the other hand, he argued that the crew of the ‘Britannia Seaways’ displayed courage and good seamanship for which they were awarded the IMO award for bravery at sea. Ability of a Master to assess the situation under intense time pressure. A requirement for clarity of thought. A realization that the ‘buck stops with me’. May need action where there is no possibility to make a plan ‘B’? A positive mind-set required because if the Master concentrates too much on plan ‘B’, it might divert attention from the key item to focus on. Ability to use your training and experience to adapt to and solve the situation. Training can help build good seamanship skills. It is not a mandatory course. It is a place where mistakes can and should be made. Seamanship takes the training and blends experience and knowledge. Iain noted that a ‘certificate of competence’ is not ‘a certificate of experience’. In summing up, he stated that the greatest compliment is referring to one who goes to sea as ‘a good seaman’. Anna’s paper looked at the human element and poor seamanship skills. She argued that negligent seamanship is not intentional – it happens due to lack of care. It might well be due to an inability to respond to a situation which is stressful. Research shows there is interaction between human stress and decision making. Stress is affected by perception, and stress affects behaviour. In the ship environment, when ‘demand’ (work pressure) exceeds an individual’s resources, there is possibility for stress to be created. In this context, demand is the performance of the duty. Resource is the physical and mental ability to meet with the demand of the job within the time available. Anna then went on to develop her arguments about human performance. The performance curve varies with the time of the day. Also, poor handling of stress means decision making is clouded and it may also result in poor health. Anna closed her presentation by providing the audience with some food for thought. • Is stress the latent defect of modern seamanship? • How can we prepare seamen to handle stress? • Should we include stress management in our loss prevention training?  About 700 falls from height are reported annually, i.e. about twice daily.  800 back injuries, costing about USD 30 million per year.  600 injuries from flying objects, costing about USD 8 million per year.  Line handling accidents cost on average over USD 1 million per year. But he maintained that there are too many lost opportunities when it comes to really finding out what happened and then closing out the problem in a proper way. The Club considers that much of the information produced was worthless – poorly prepared accident reports, incorrect root cause analysis and failure to deal with long term ‘bad habits’ that make these accidents happen frequently. In summary his message was – Shortcomings are opportunities for improvement but if we do not have the right skills to identify them, we lose that opportunity. 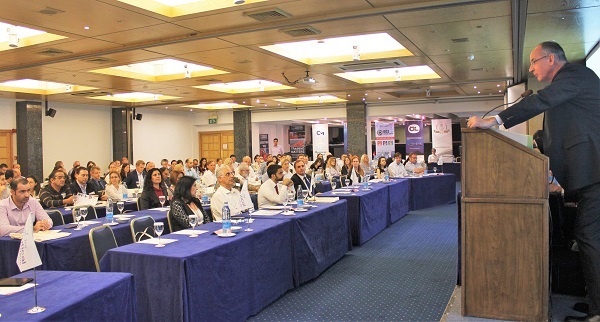 Modern seamanship- a serving Master’s perspective- Captain Amir Younes, Master, Österreichischer Lloyd Seereederi (Cyprus) Ltd.
Captain Younes reminded the audience of that well known statement that most of the accidents were attributed to human error. He gave some very clear but simple examples of the ‘technology v training’ deficit. In his experience, not all seafarers are familiar with the proper use of computers on board. The theoretical training is good but the practical training is missing. Seafarers receive detailed college based training on how to calculate the stability and the stress calculations manually. But the education does not include the use of the different types of loading computer programme or even include it in a limited way. Most vessels now carry computer basis training programs but not all crew are familiar with its usage and how to get the best from it. At the higher technological level, seafarers should be able to read and understand the instruction manuals on board. Do all of the crew have the required standard of English and are the manuals written in such a way that they are readily understandable to non-native speakers? Captain Younes argued that due to the modern control systems on board, there is an increased need to have really qualified Electric/electronic Engineers on board. Learning the job only by experience is not suitable anymore. The GMDSS system contains only SAT-C as a mandatory communication system. Using the SAT-C allows the user to send / receive only TXT format. Captain Younes argued that this is simply not practical any more. Perhaps part of the training could include introduction of the new technology for marine communication. The vessels, the maintenance plan and the spare parts control is made by Planned Maintenance System (PMS) software. The Bosun and the Cook also need to be able to access and update the inventory. Unless company specific training is provided, PMS is not included into an essential training and education model. Captain Younes maintained that we are currently relying too much on ‘self-development’ but the working environment, tight schedule, and limited access to training materials are barriers. Increased workload such as paperwork, daily monitoring, numerous inspections, all restrict the facilitation of learning and mentoring. Finally, Captain Younes questioned if our traditional learning models were still relevant. Should there be a worldwide maritime training database with inputs from technology companies, from shipping companies, from authorities, from training institutes, and professional organizations like the Nautical Institute? Seamanship- a shipowner’s perspective- Captain Eugen-Henning Adami, Managing Director, Mastermind Shipmanagement Ltd. The vice-chairman of the branch, Mikhail Konoplev, presented the paper in Captain Adami’s absence. Comparisons were drawn between ‘traditional seamanship’, and what could be the requirements in the future. Traditionally it meant rope work, hands on knowledge of weather, and physical strength. Today, the success of the voyage depends on IT skills, timely reporting to the office and charterer, completing checklists, filling data in planned maintenance software. Good communication skills are vital at sea. Seamanship and hands-on knowledge are often left to Wikipedia, Shipping Apps, Online Tutoring and Remote Diagnostics, or to sensors. A good balance could be found where IT can assist with trim, cargo and voyage management. Controls of the speed and course will remain with the Master. He also presented a concept design of an unmanned ship, which could pose an altogether new challenge for seamanship skills in the future.  Are we including ‘seafarer stress’ in our root-cause analysis? If yes, should we include stress-management as a possible solution. If yes, how can it be done?  Examples of new skills that modern ratings need to have were discussed. Hydro blasting, paint spray machines, modern gas detectors, computer skills for stock-keeping and training and following up cargo plans.  Examples of skills which are no longer relevant: Morse code, signals. Time given for training in celestial navigation and compass error through sun/ stars could be reduced.  Some delegates felt that Seafarers also need to be trained in the ethical use of social media.  Training requirements for seafarers should be reviewed, especially with regard to new technology.  Standards of training and watch-keeping should be updated more frequently.  IT skills need to be part of seamanship training.  Training on obsolete technology and means of ship handling need to be phased out gradually.